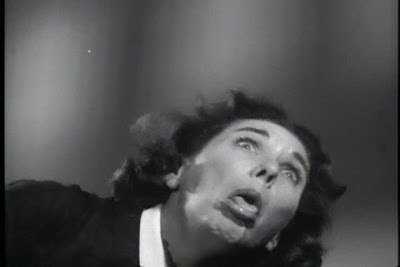 I've been watching the wrong movies, I guess, because I haven't spotted a Ridiculous Face of Death in ages. "Then whatchoo postin' 'bout, Willis? ", you might say- a legitimate question, if oddly phrased. Well, the arbiter of taste and (I assume) good grooming himself, one Mr. Arbogast, brought the following RFoD to my attention. It's from Blood of Dracula (1957), which I've never seen. According to Arbo's write-up on it, however, Blood of Dracula essentially seems to be I Was a Teenage Girl Dracula, a concept I can get behind. The fact that the film features such a fine RFoD has me doubly getting behind it. Or something. It's the use of the tongue that really makes this one shine. And I don't mean that euphemistically. Would Ned Tebbet's Almost-Death Face from the original Salem's Lot miniseries qualify as a Ridiculous Face of Death? Of course, he's not dead yet, but he soon will be. Or Undead. Eh, scratch that. Adding a section to the blog called "Ridiculous Faces of Pending Un-Death" is both wordy and limiting. And I can't really fault Ned. If Barlow suddenly popped up in front of me I'd probably make a similar, if not more ridiculous face. Or I'd just scream and pee. This movie is awesome. I have it on VHS because I am better than other people. So yeah. The poster of this movie freaked the hell out of me when I was a kid! The image of this bushy-browed vampire lady attacking a prone guy was the not the most pleasant image for an 8 year old to see. The tagline did not help matters: "Will giver you nightmares forever!" #1- I love this movie and have been calling it "I Was A Teenage Dracula" since I saw it. I see you have made my title better. #2-I did not even remember this face. Obviously it has been too long since I've seen it. #3- I have Teenage Frankenstein on VHS, or as I like to call it, "I Was A Teenage Teenage Frankenstein." You should borrow it. It's terrible, but its on VHS and its OOP (Or it was when I bought it). So is she choking on a dinner roll or what?